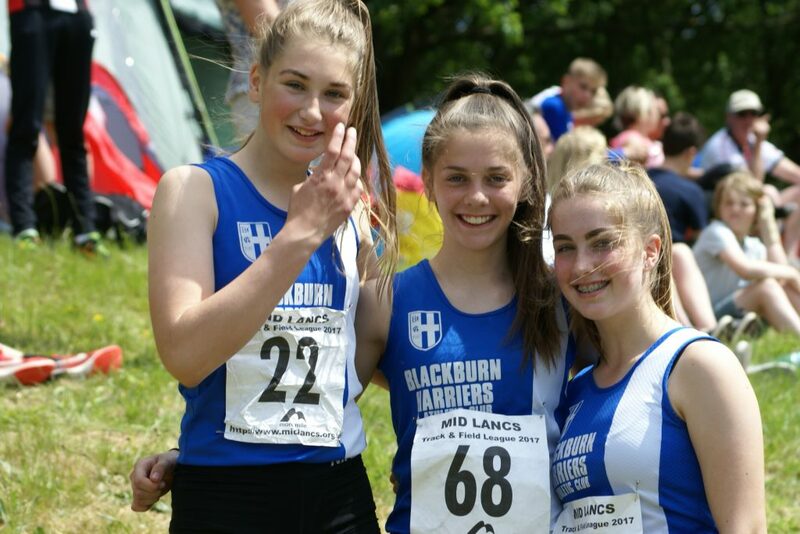 There was a threat of thunderstorms and heavy rain as athletes gathered for the second of this years Mid Lancs fixtures at Witton Park yesterday, but thankfully it didn’t materialise and the day went off in warm weather the predominate feature of the day which also featured fifty six Blackburn Harriers competing on the Bank Holiday weekend. 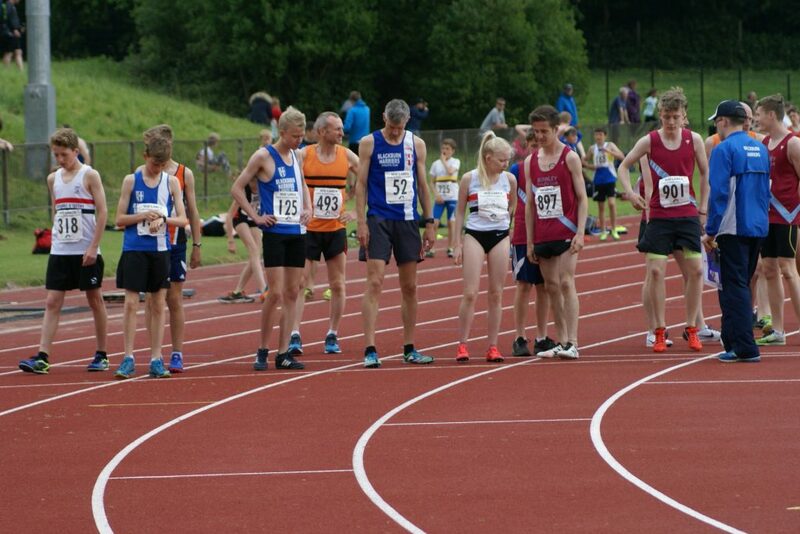 Many thanks once again to all the Officials who helped run the day almost on a skeleton crew basis and there is little doubt that the whole issue of having enough and competent Officials is a serious issuing facing the sport of athletics. 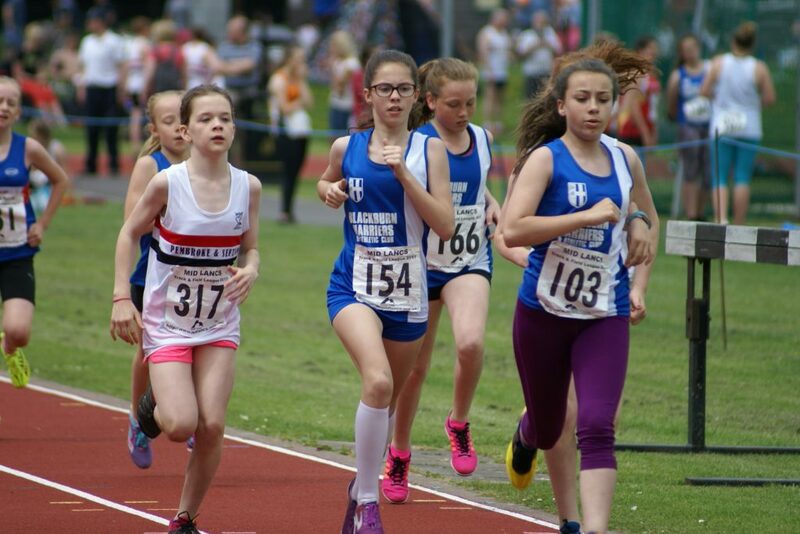 Athletics in general as well as Blackburn Harriers is crying out for parents of athletes to volunteer to come forward and train up to be Officials, progressing through to a point where they actually run events. 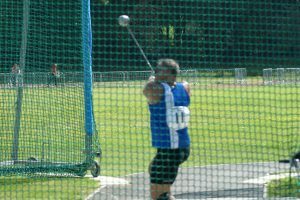 Apologies for the poor Throws Photo’s and others – experimenting with camera settings when trying to capture good movement shots, proved to be a disaster – lessons have been learned!!! 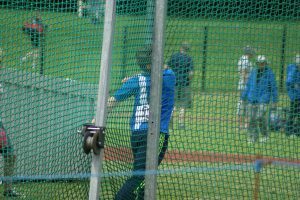 The development of the Harriers Throws Squads has been very impressive and evidence of that was seen again at this latest fixture with wins in the Hammer for U17 Jacob Roberts winning the Senior Men’s Hammer with 55.47m, Sam Gaskell winning the U17 Hammer with a distance of 44.68m and Charlotte Williams winning the U17 Women’s Hammer with 56.53m. 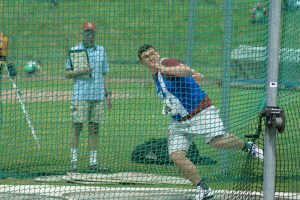 There were also throws of 30.61m for V50 Tony Balko in the Hammer (4th) plus 3rd in the Discus (29.16m) and 19.72m for Izzy Thompson in the U15 Girls Hammer (5th). 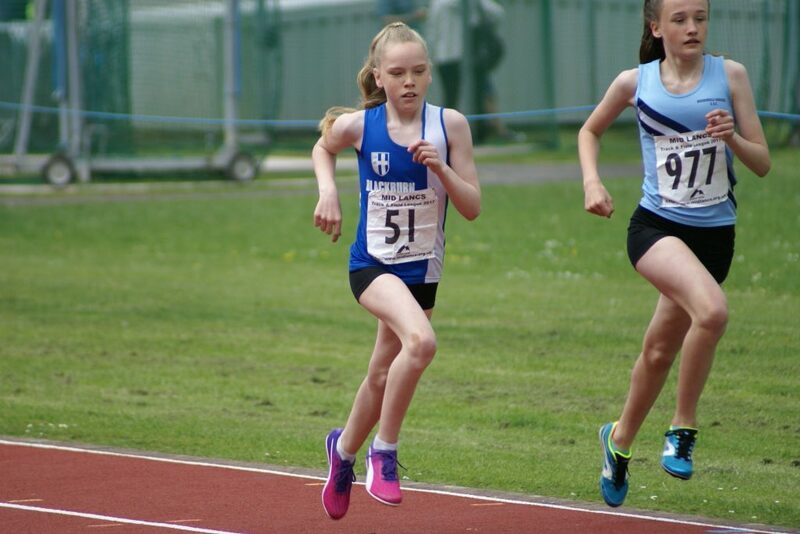 U13 Nicky Saunders just can’t stop winning, her latest outing seeing her win the Javelin (24.73m), the Discus (26.61m) and an amazing new PB and Club Record Shot Putt with 9.36m which is a metre and a half further than her previous best. 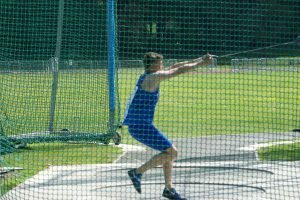 U17 Lucas Davies won the Javelin with 26.64m came 3rd in the Shot Putt (7.99m) and 2nd in the Discus with a new PB of 28.38m. 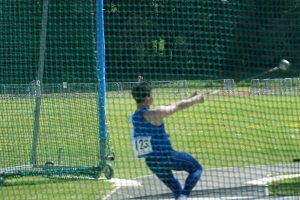 U17 Anthony Kent who has already achieved the English Schools and National Standard qualification won the Discus with a throw of 41.66m and the Shot Putt with 12.71m. 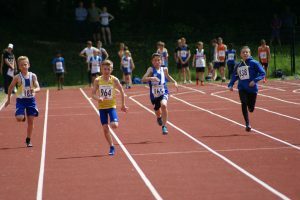 In the U13’s Kyle Taylor-Pomfret won the Javelin (22.39m), whilst Dexta Thompson came 4th (19.68m), Isaac Butler 7th (14.36m) and Codie Dewhurst 8th with a distance of 12.82m. 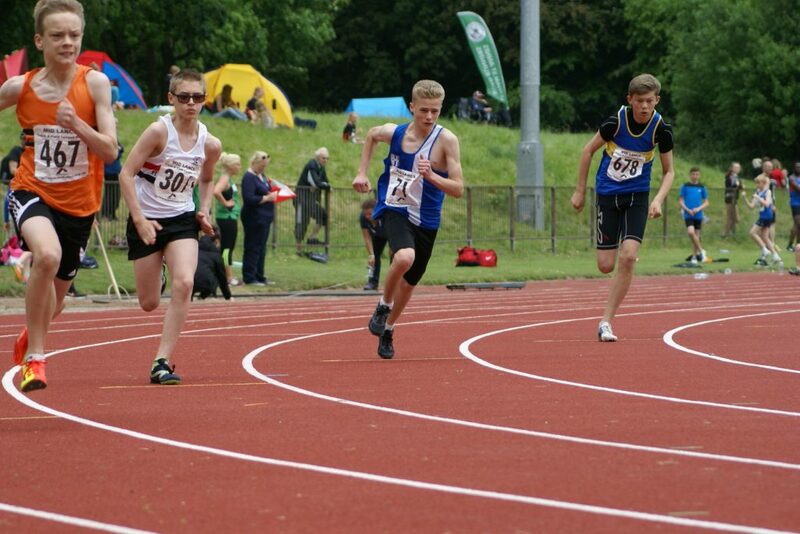 U15 George Whittaker threw 24.76m in the Javelin for 3rd spot and a new PB by over 2 metres. 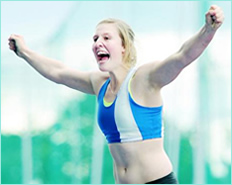 Great to see Holly Brookes back competing after having shoulder problems, in the Senior Women’s Discus (4th) with 22.63m and the Shot Putt – 4th again – with 7.42m. 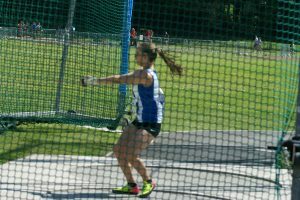 U17 Emily Taberner was competing in just her first competition of the year and up in age category taking 3rd in the Discus with 20.82m and 3rd in the Shot Putt with 8.55m. 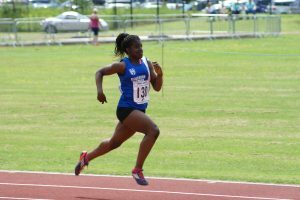 Abigail Brown set a new PB in her U17 Shot Putt (4th) with 8.26m, placing 6th in the Javelin with 21.54m. 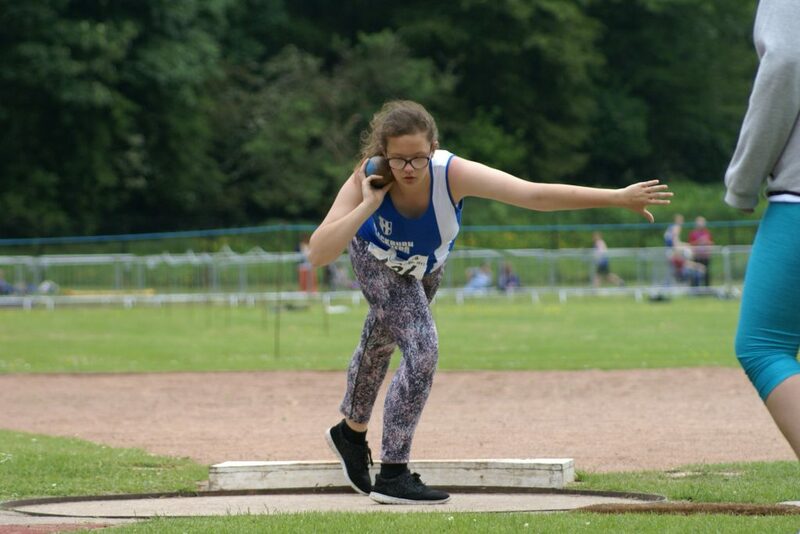 Bottom of age U15 Izzy Thompson placed 8th in the Shot Putt with 7.08m and 2nd in the Discus (22.51m). 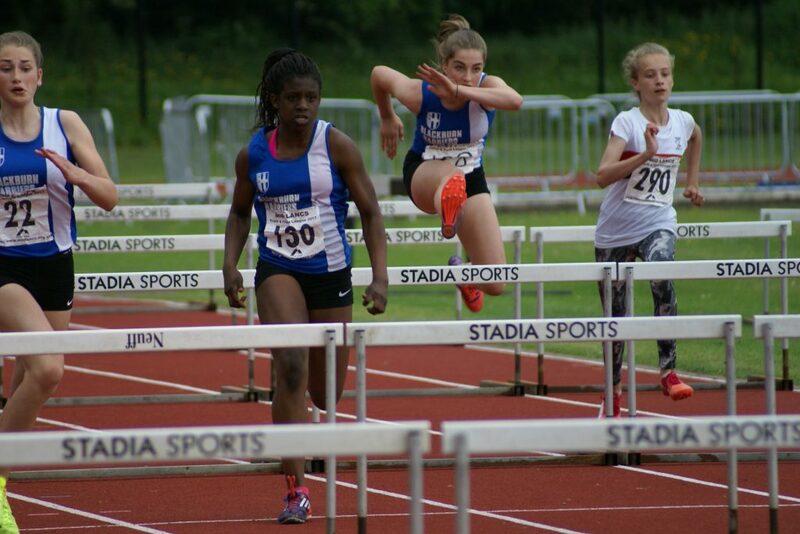 Myah Booth who has just set the English Schools qualifying time for the U15 75m Hurdles came 2nd in the Javelin with a distance of 24.69m with Caiden Hesketh in 3rd spot (22.60m) an event that she has never competed in before. 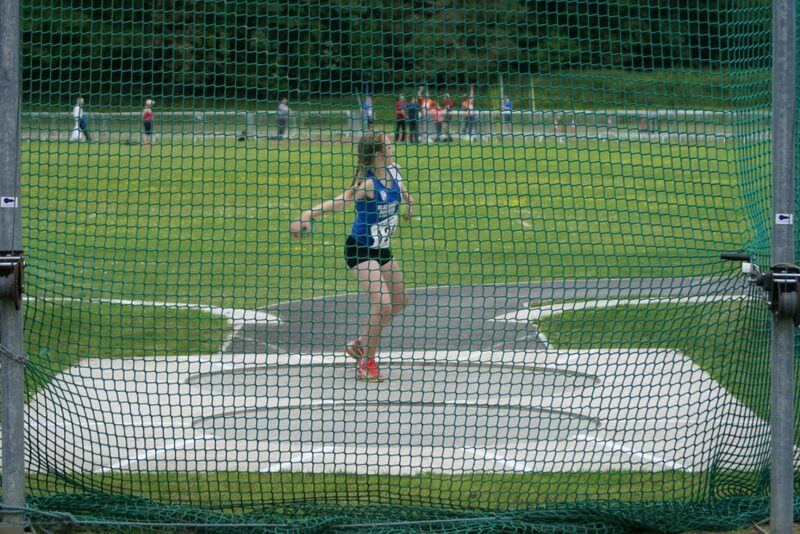 Caroline Woodworth (U13) decided to chance her arm at the Throws instead of her usual Track race and did really well coming 2nd in the Discus (16.24m), 5th in the Javelin with 20.51m and 10th in the Shot Putt with 4.09m. 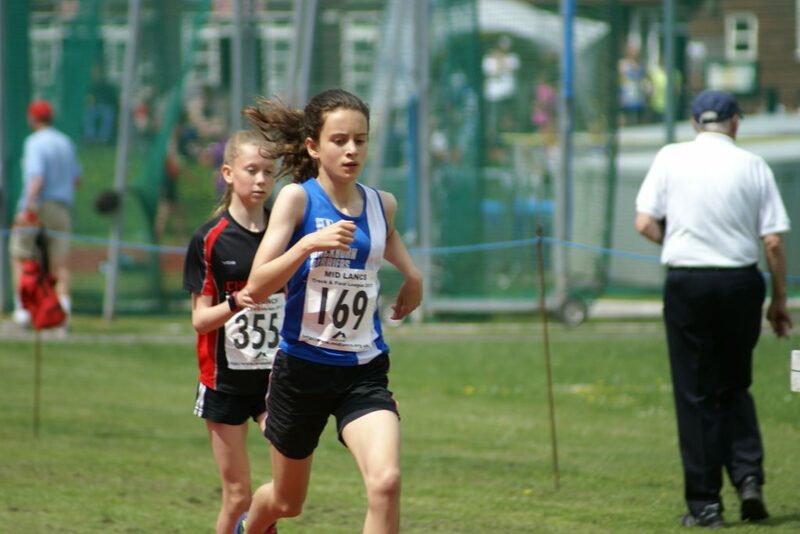 Danielle Probert just missed out on a new PB in the U13 Girls Javelin finishing 8th with 17.96m. 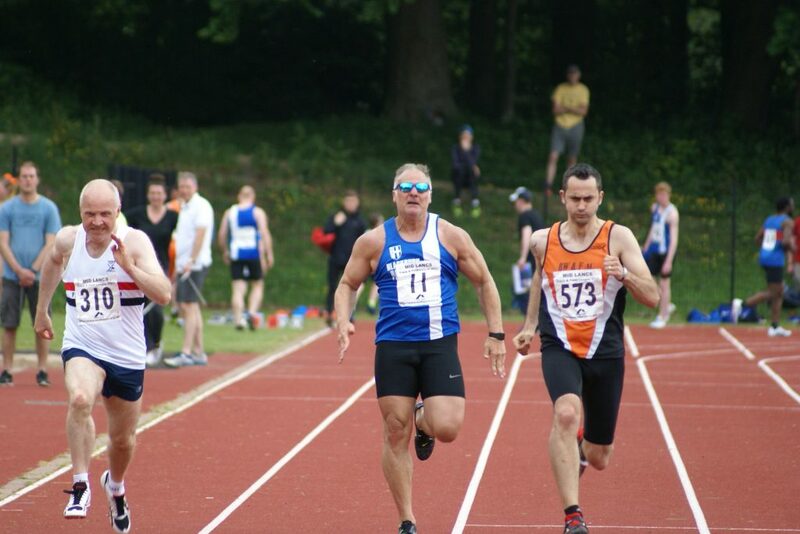 Lots of sprinters out for the Club too with Dominic Bretherton taking 2nd in the 100m (11.60) and 2nd again in the 200m (23.8). 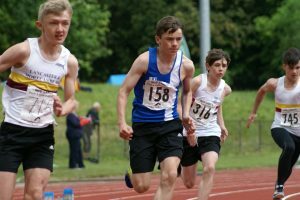 U17 Ben Whittaker set a new PB by two tenths in the 100m with a time of 12.30 (4th) and another new PB in the 200m – 2nd in 25.3. 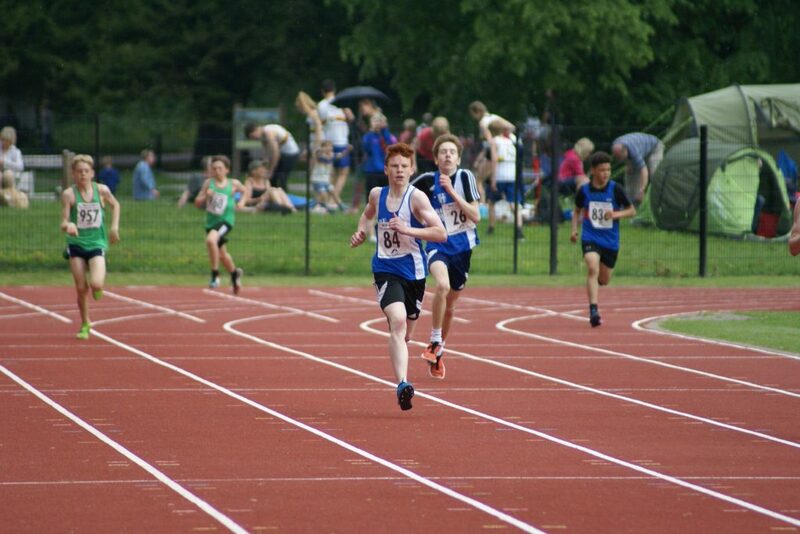 U15 Kyle Mashiter also got in on the act with a new PB of 12.20 in winning the 100m followed in by Jonathan Gough in the U15 Boys Heat (1) 200m placing 2nd in 26.70, the first time he has raced over the distance – and V50 Tony Balko ran the 100m in Heat (2) posting a time of 13.5. 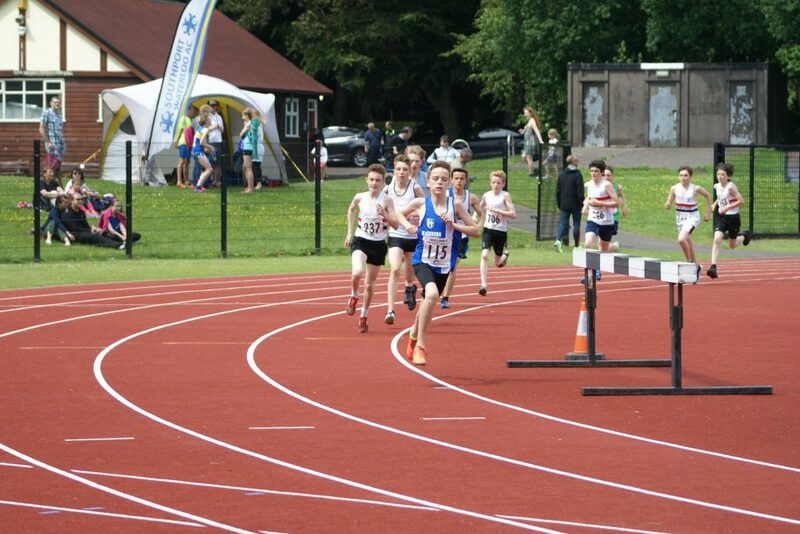 Sam Hodkinson took a break from 800’s to have a go at the 200m and duly won Heat (2) in 26.6. 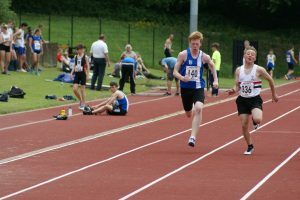 U15 Jonathan Gough entered the U17 Boys Triple Jump and won it with a leap of 11.10m – (the Club record being 11.30m) – and again, the first time he has competed in the event in a T & F fixture – expect the Club Record to go this year. 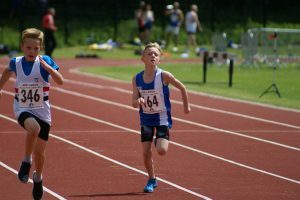 U13 David Holman took on the 100m instead of his usual longer race and ran very well for 3rd spot and a time of 14.2 followed by Codie Dewhurst in the same Heat (7th) in 15.50 and a new PB. 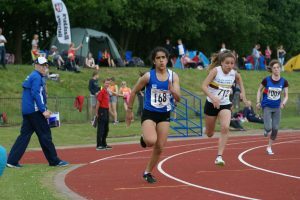 There was a new PB of 13.30 for Chloe Bleeks in the U17 Women’s 100m (3rd) and a win in the 200m (27.6) showing great acceleration off the bend to set up the win for herself. 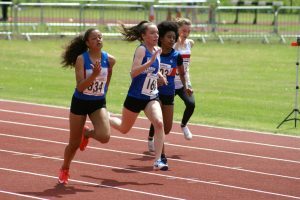 Next up with a new PB came Queen Tanimowo in the U15 Girls 100m – 2nd in 13.10 Heat (1) followed in Heat (2) by a new PB for Bailey Madden winning in 13.0 – in Heat (3) a new PB for Myah Booth 2nd in 13.5 – in Heat (4) Aysha Karolia after a lay off came 4th in 14.4 – in Heat (5) it was Abigail Armas placing 3rd in a new PB for her of 14.10 and in Heat (6) Maia Bowman came home in 2nd spot with a time of 14.20. 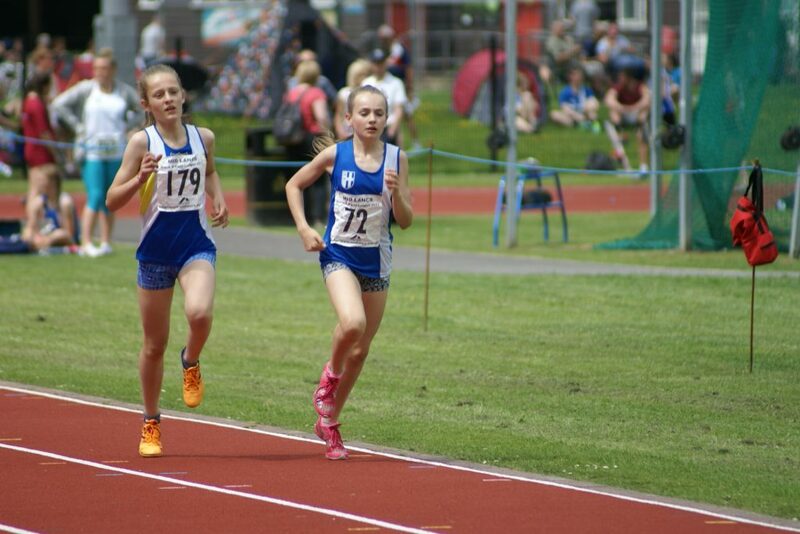 In the U15 200m’s Bailey Madden placed 2nd in 27.70 and Christie Sturgess 4th (29.00) in Heat (1) with Macy Haworth in Heat (2) 4th (29.60) and her first race over the distance – and – in Heat (3) Aysha Karolia also 4th in a time of 30.7. 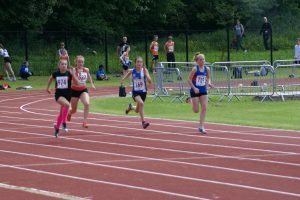 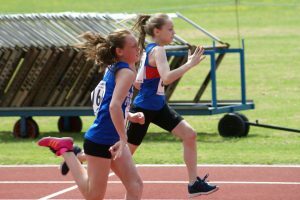 A number of U13 Girls were out tackling the Sprints which saw Kate Cookson finish 4th in 15.10 in Heat (1) of the 100m – Eva Knowles place 5th in 16.00 in Heat (3) — In the 200m it was Leah Hoole coming home in 5th (30.80) in Heat (1) – Hannah Eccles 3rd in Heat (2) with 32.4 – Keira Haxton Heat (3) 2nd in 32.8. 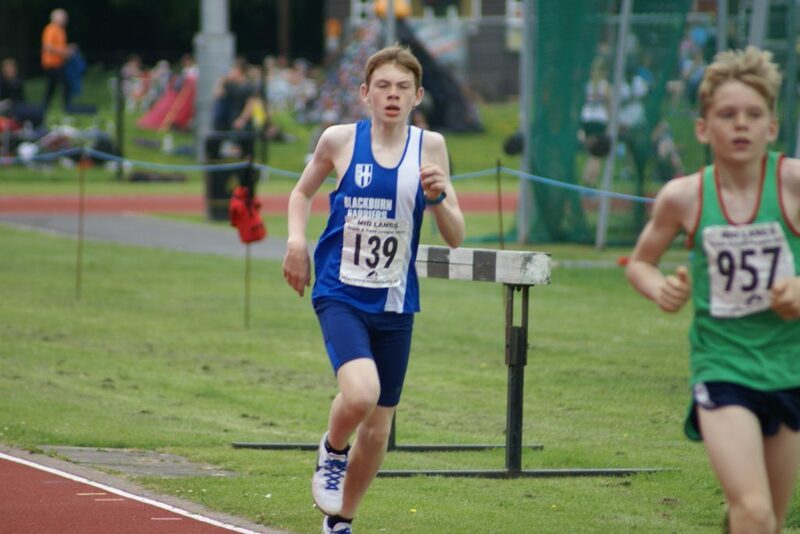 U17 Bradley Meikleham had an existing personal best of 2.39.3 for the 800m and he went out determined to massively undermine that time and that’s exactly what he did by knocking nearly half a minute off to place 4th in a new PB time of 2.12.5. 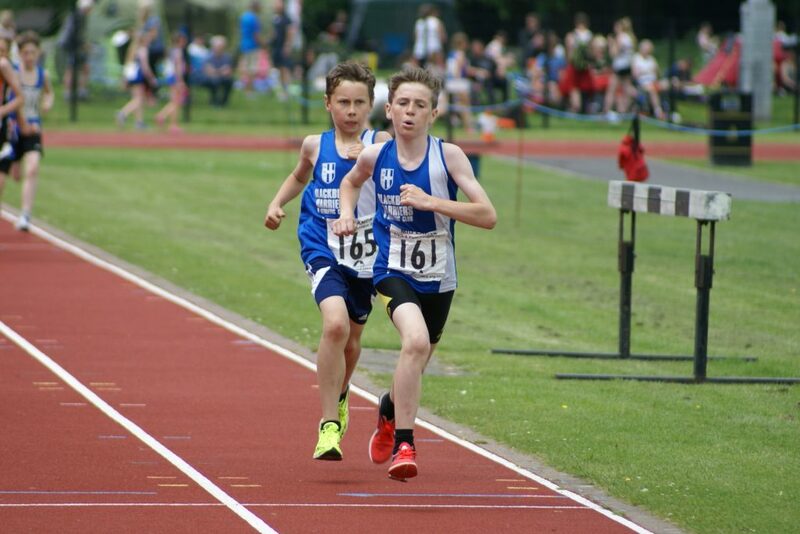 U15’s Ethan Joyce and Ben Branton were also determined to produce good times for the 400m, a race which saw Ethan place 2nd in a new PB of 59.0, some five seconds better and Ben placing 3rd in 61.80 – his first time over the distance in a competitive race. 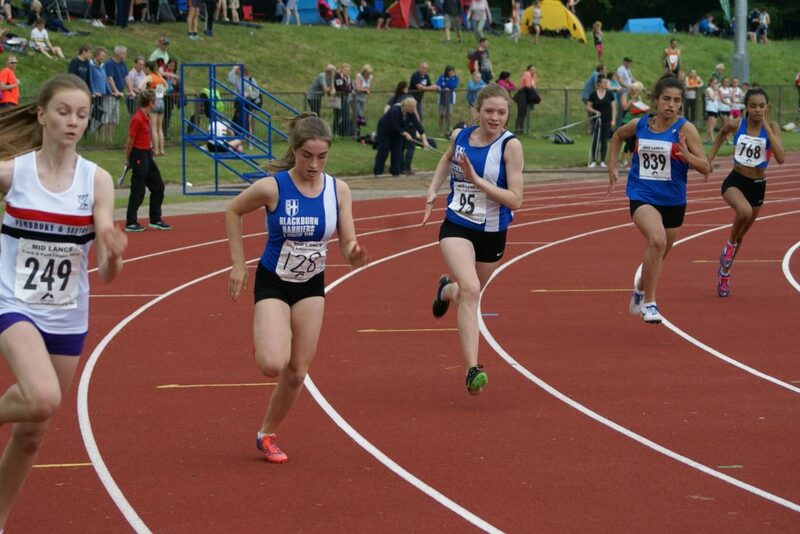 U15 Eleesha Charnley had her first ever competitive 300m track race finishing 2nd in a good time of 46.0. 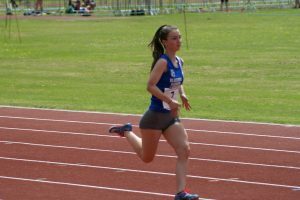 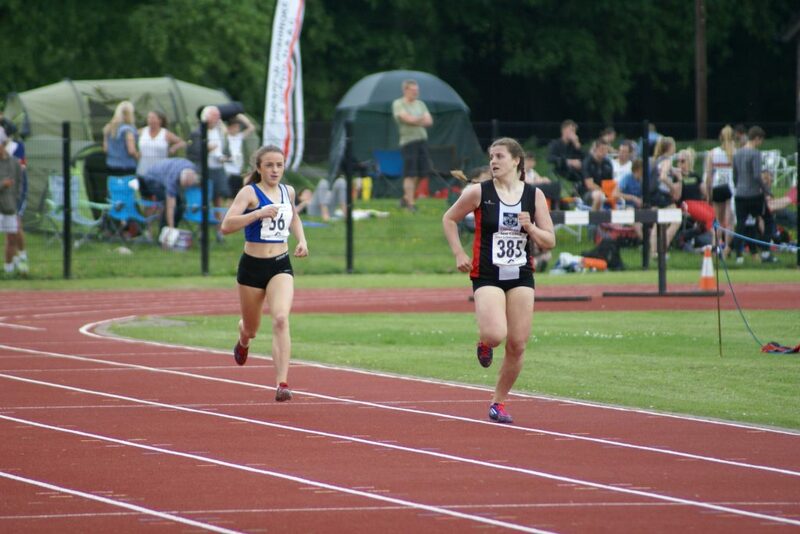 Charlie Coy ran in the Senior Women’s 400m Race and ran a new PB by nearly three seconds finishing 3rd in 60.4. 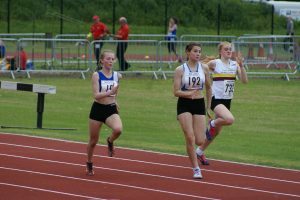 Maddie Elliott was just two tenths outside her personal best over 800m when she came 2nd in the U17 race in a time of 2.21.3. 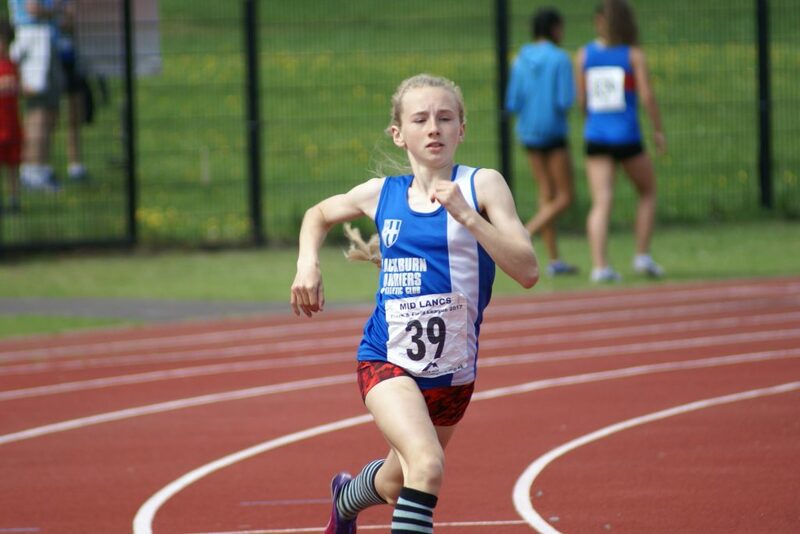 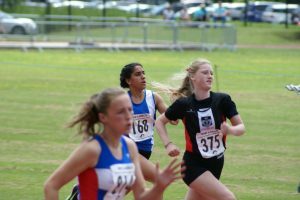 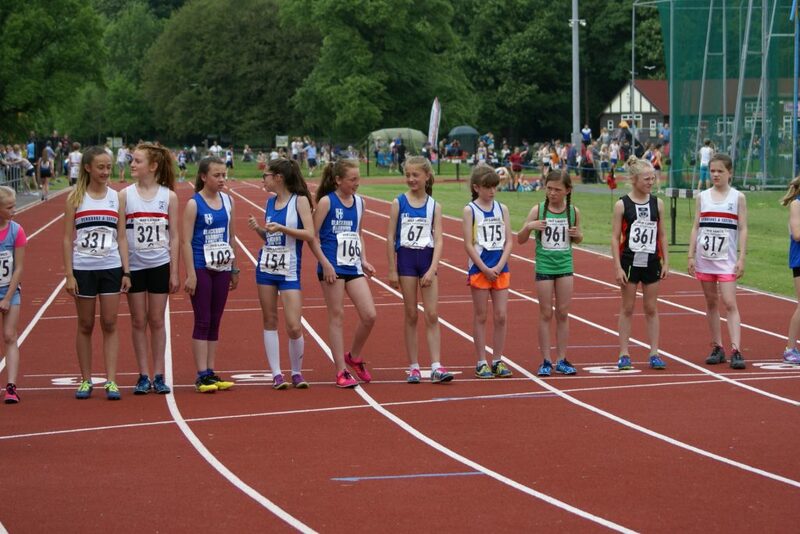 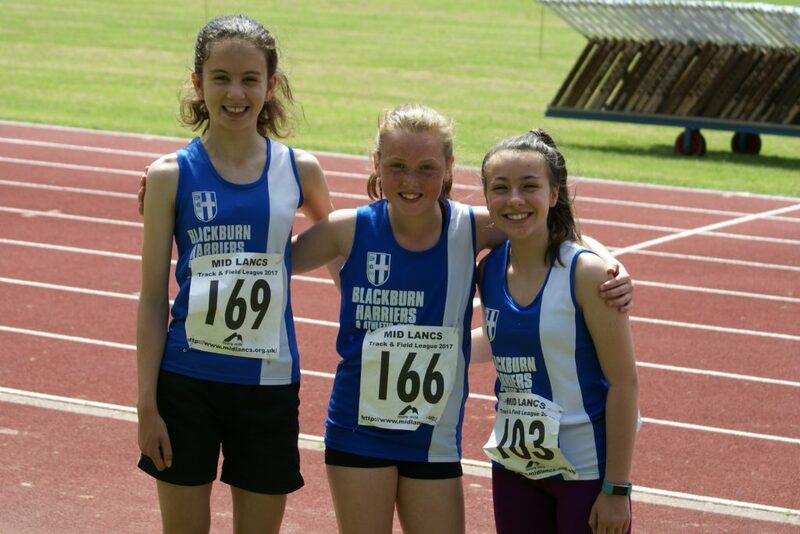 Amy Davies reduced her best time for the 1500m by three seconds to post a new PB of 5.03.1 in the U15 Race whilst in the U13 Girls middle distance races half a dozen youngsters went for the 800m – Leah Hoole taking 3rd in Heat (1) with 2.34.4 and Kate Cookson 9th in 2.57.3. 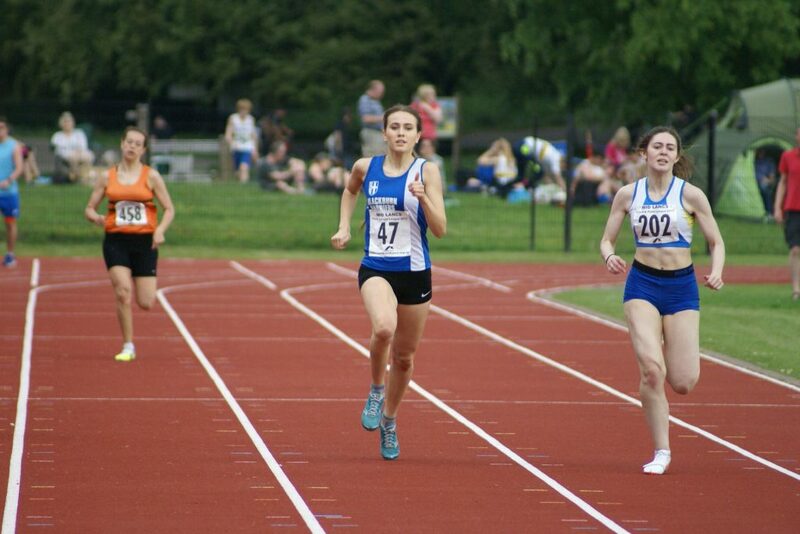 Heat (2) saw Molly Nicholls run 2.53.9 in 5th with Hannah Eccles in 6th (2.54.00), Keira Haxton in 9th (2.57.0) and Eva Knowles 11th in a time of 3.02.5. 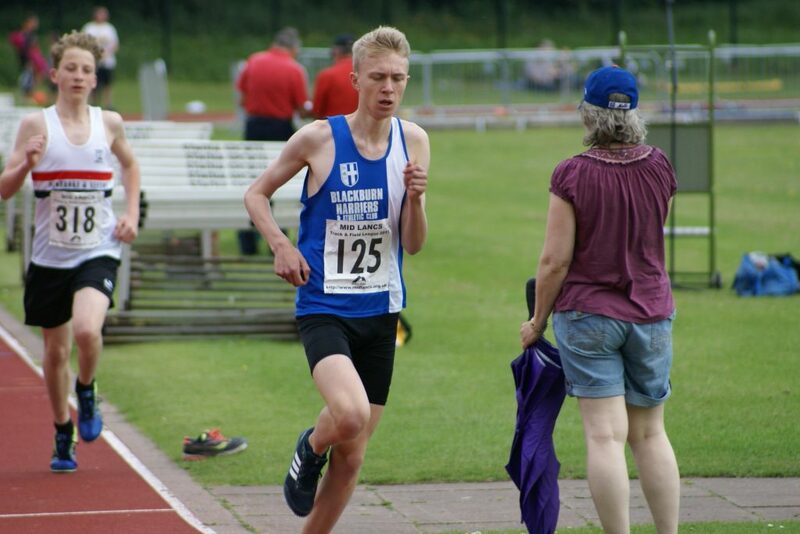 The 3000m race combining male and female mixed aged runners – won by Daniel Collinge in 9.30 – saw three Harriers occupy places two, three and four with V40 Chris Davies agonisingly a second shy of a new PB in 2nd ( 9.34.7), Nick Smith (U17) had a great run cutting seventeen seconds off his previous time to record a new PB of 9.53.7 followed by U15 Jamie Teare, also setting a new PB time of 10.14.7 – some sixteen seconds faster than his previous best time. 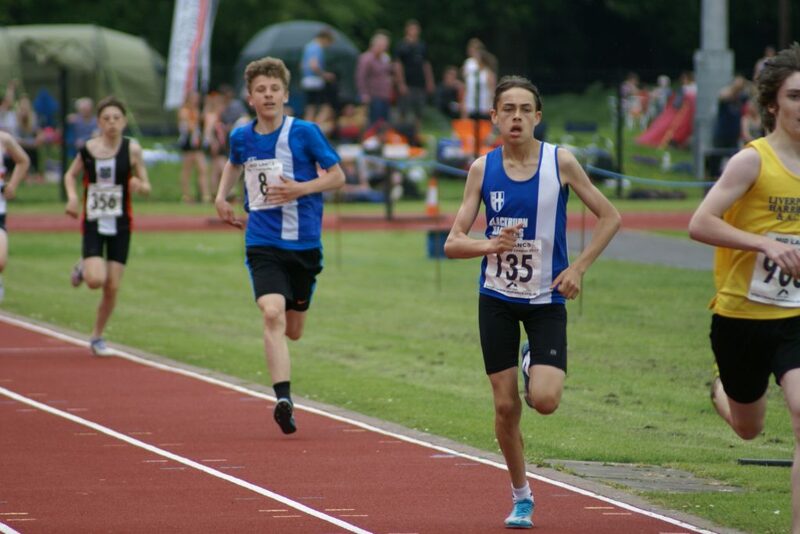 U15 Leon Thomas set a new PB in the 800m placing 2nd in 2.09.6 with Harvey Ashworth in 7th (2.22.7) and George Whitakker in 9th posting a new PB time of 2.34.3 a whopping sixteen seconds faster. 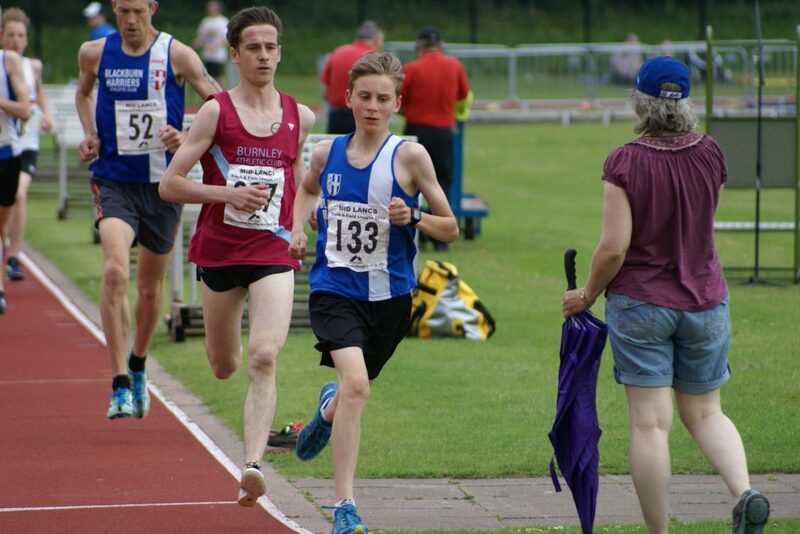 Matt Ramsden was chasing the English Schools U15 1500m qualifying time and set a new PB of 4.26.1 (2nd) in the attempt. 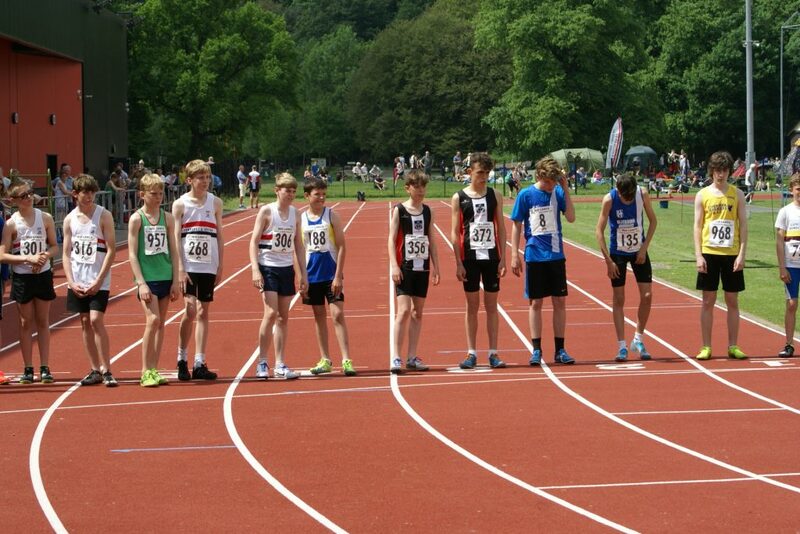 Harry Wilkin placed 6th in the same race with a time of 5.00.1 and a new PB by nine seconds. 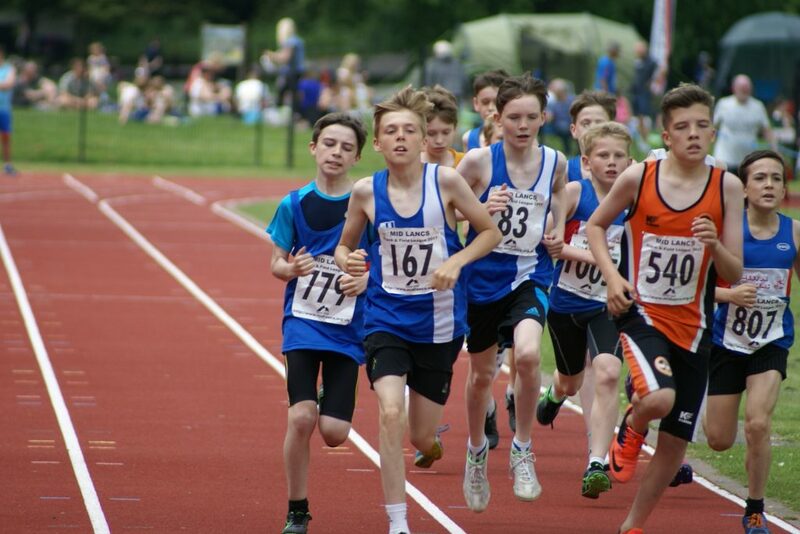 The Harriers U13 Boys occupied the first four places in the 800m which saw Dexta Thompson set a new PB of 2.26.2 in winning the race, David Holman place 2nd in 2.31.0, Joseph Joyce also setting a new PB in 3rd (2.34.6) and Isaac Butler making it a hat-trick of new Pb’s in 4th spot with a time of 2.36.4. 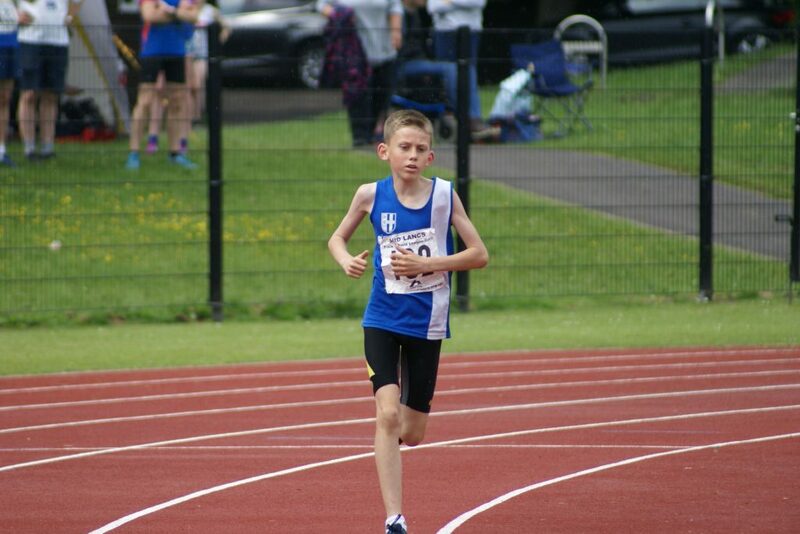 In the U13 1500m Kyle Taylor-Pomfret cut eight seconds off his time to set a new PB of 5.08.1 in 4th place to complete a pretty good day for the Junior middle distance runners. 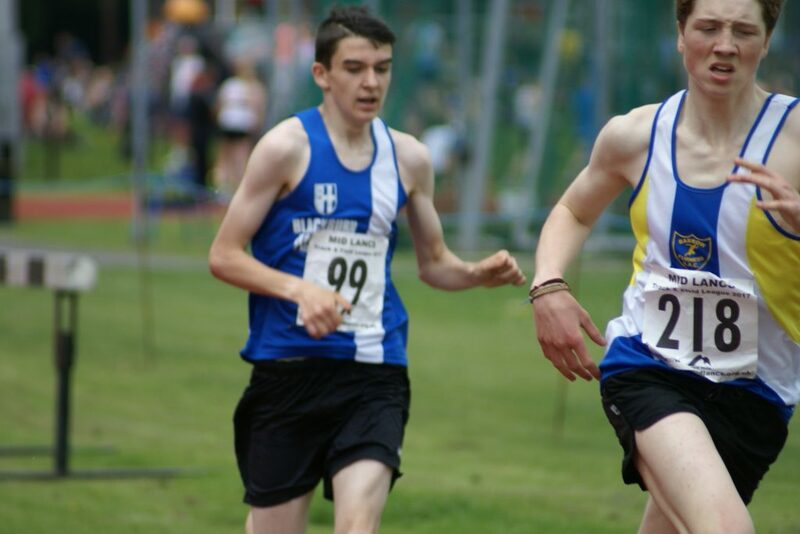 Luke Kenyon (U17) set a new outdoor High Jump PB clearing 1.75m, U17 Ben Whittaker contested the Senior Men’s Long Jump (5th) with 4.74m which was a new PB, U15 Jonathan Gough backed up his PB in the 100m with a jump of 4.84m in the Long Jump to place 2nd and Isaac Butler cleared 1.15m in the U13 High Jump (5th). 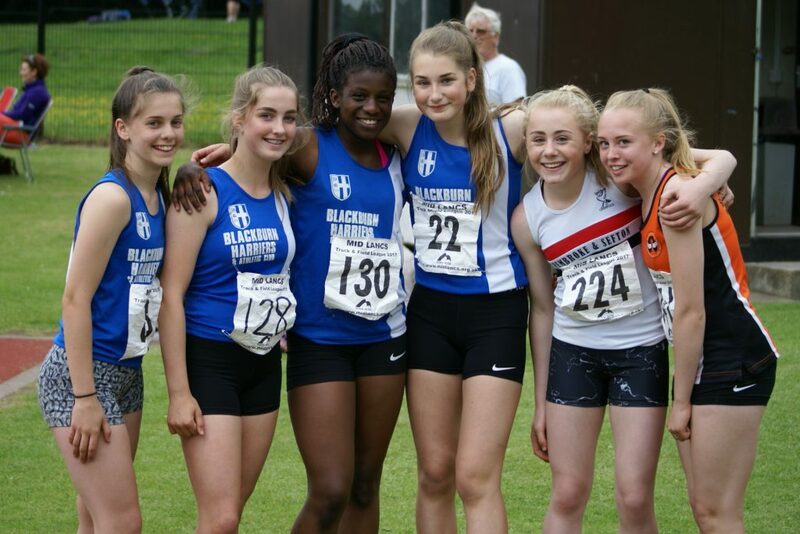 Chloe Bleeks cleared 4.27m in the U17 Women’s Long Jump (6th), Aysha Karolia (16th) cleared 3.86m in the U15 Girls Long Jump whilst Queen Tanimowo set a new U15 High Jump PB of 1.45m and Keira Haxton cleared 2.46m in the U13 Girls Long Jump. 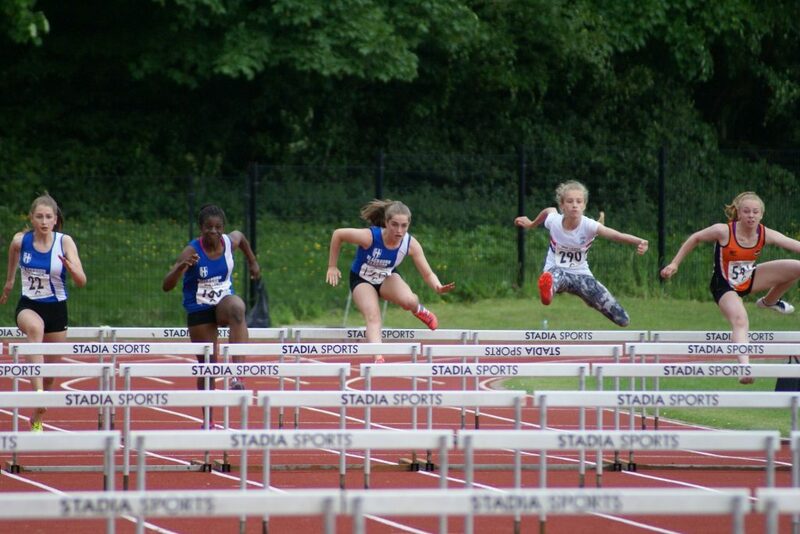 Great to see the Hurdles on at the Mid Lancs which this year sees an experiment with the timetable to include Hurdles over 70, 75 and 80m for U13 and U15’s. 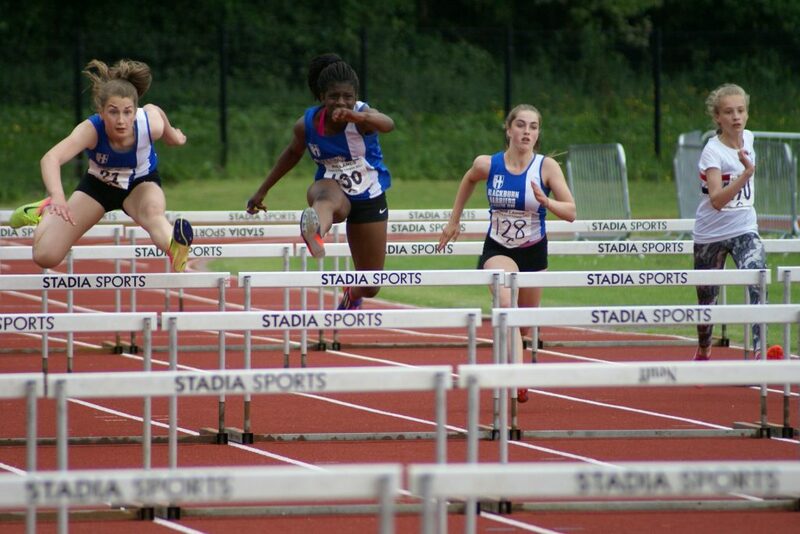 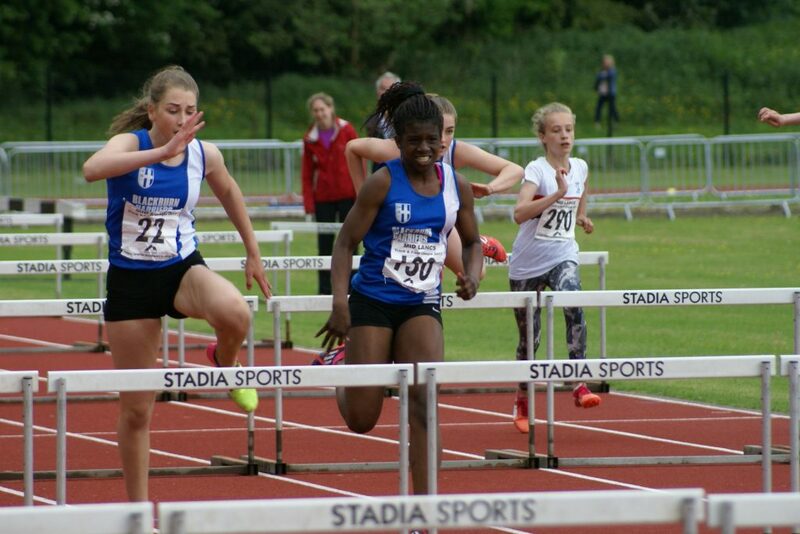 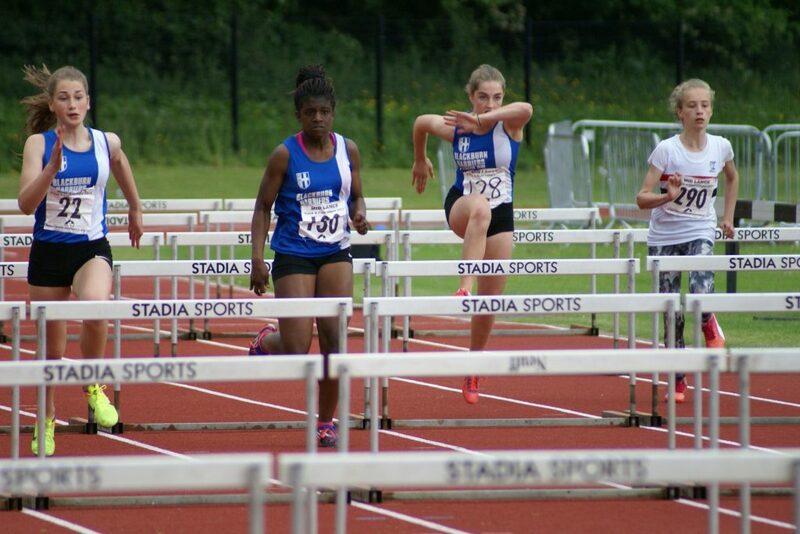 The U15 Girls 75m Hurdles featured four Blackburn Harriers, the Race being won by Myah Booth in 11.8, with Queen Tanimowo in 2nd place with a new PB of 12.0 which was half a second faster than her last race, Caiden Hesketh also running a new PB in 3rd with 13.0 and Christie Sturgess placing 6th in 13.20. 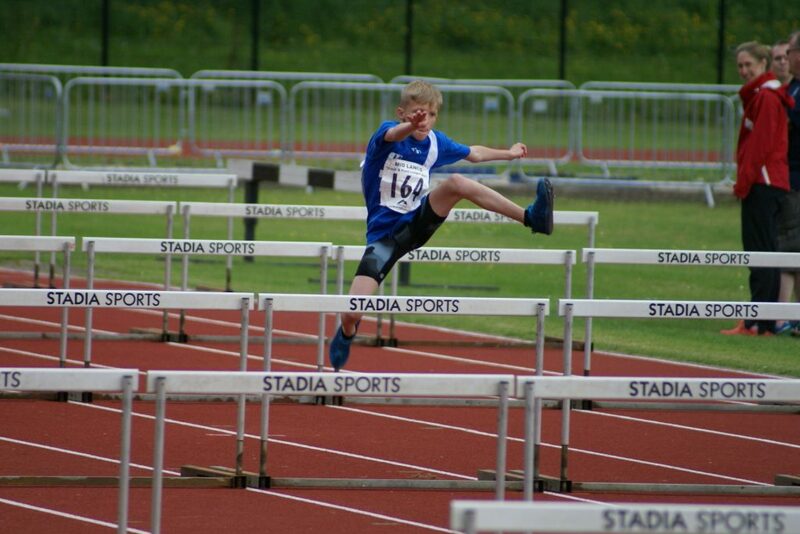 Codie Dewhurst ran the U15 Boys 75m Hurdles but there were not times recorded for this race. 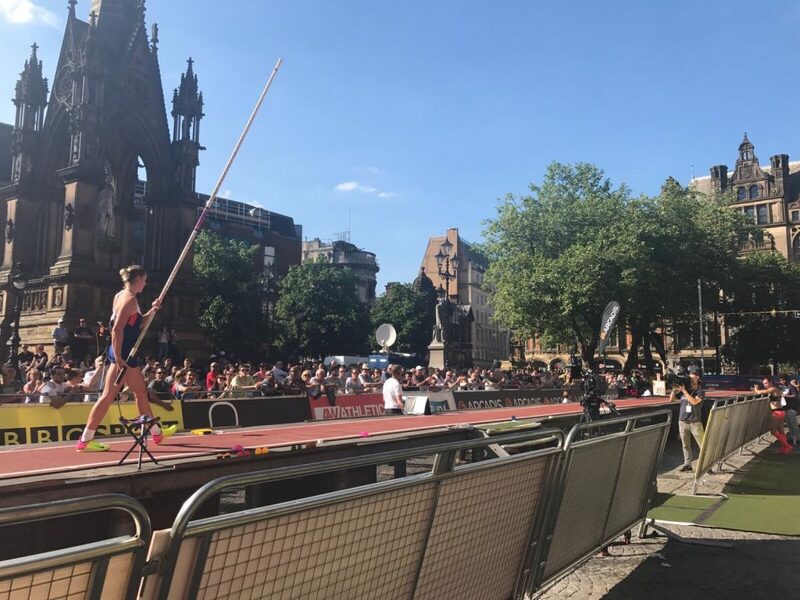 Holly Bradshaw had a fantastic competition at the Manchester Games which meant that she has climbed to 4th in the Women’s Pole Vault World Rankings. 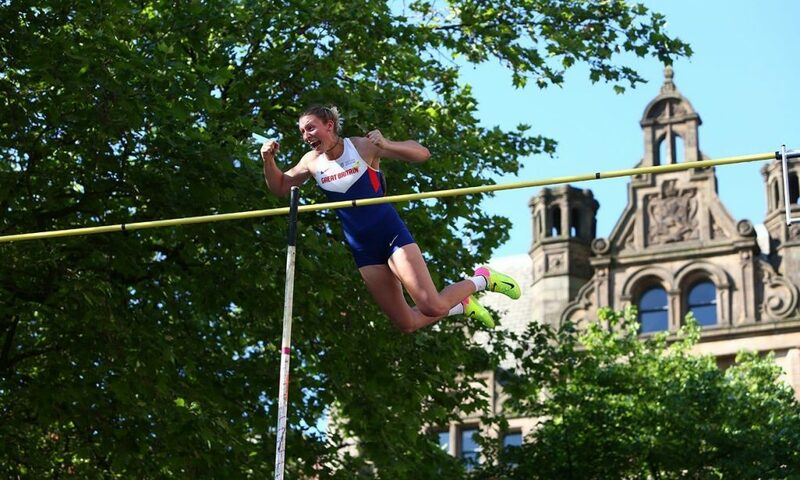 Clearing 4.50m at the third attempt, Holly went on to clear 4.72m at her first attempt followed by another first time clearance of 4.80m and with daylight between her and the bar. 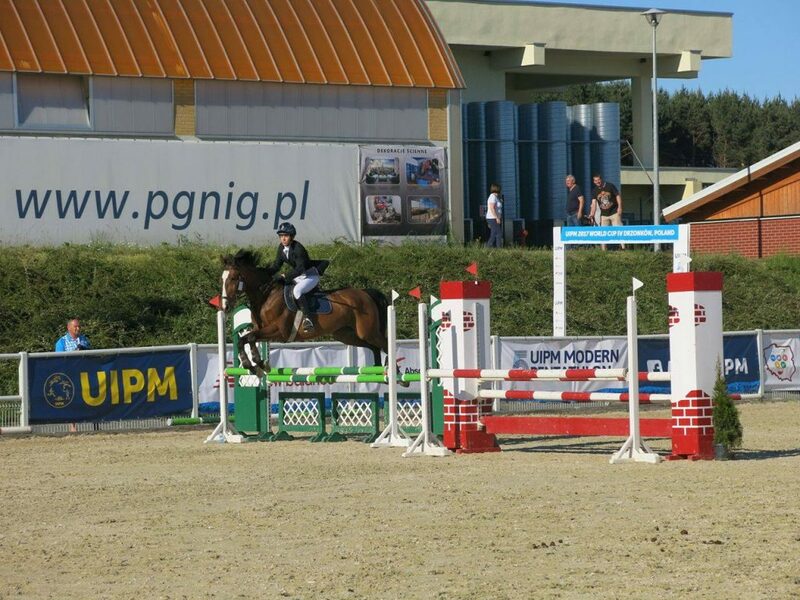 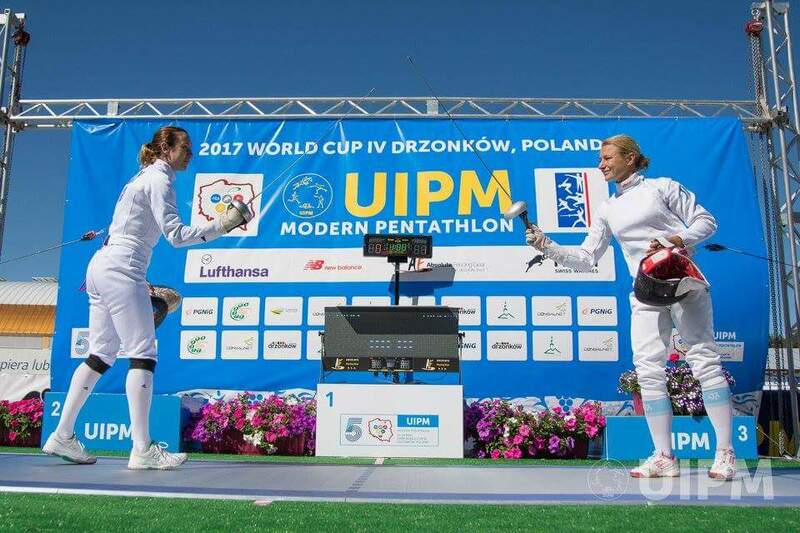 UIPM World Cup IV, Drzonkow, Poland – 24.05.2017.-29.05.2017. 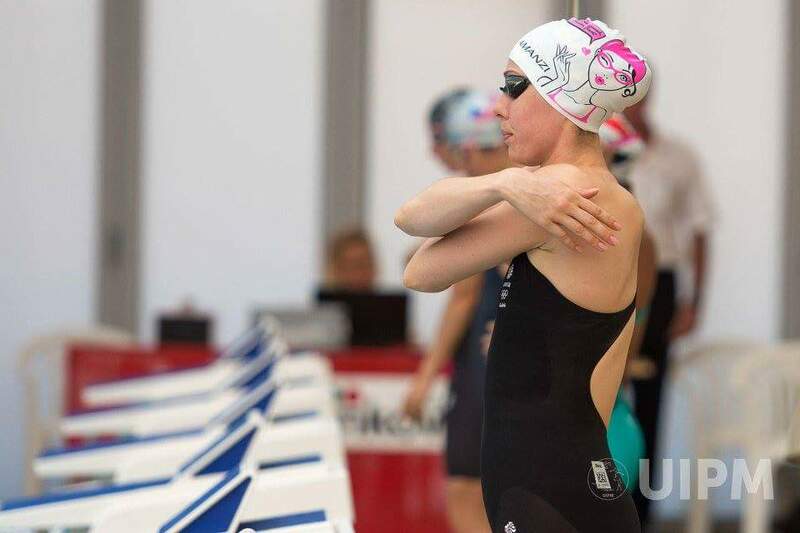 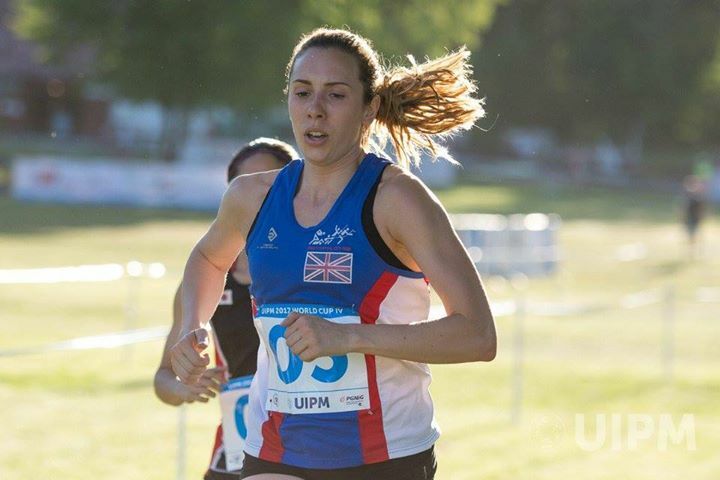 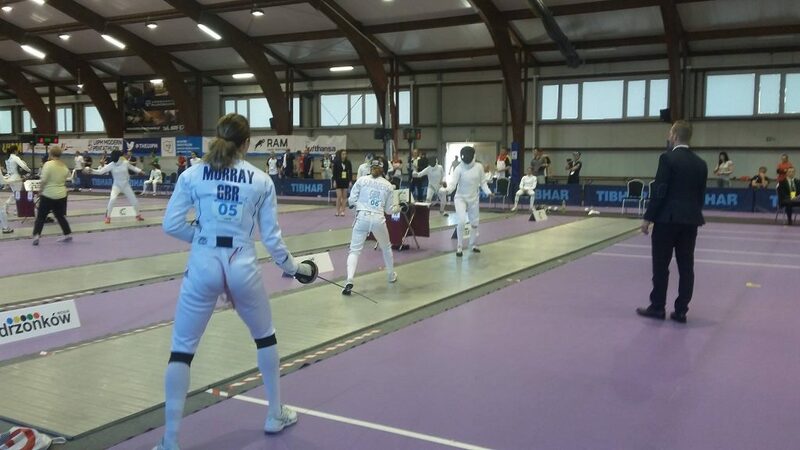 Samantha Murray was competing for Britain in the 4th Round of this years World Cup series in Poland and finished 18th overall. 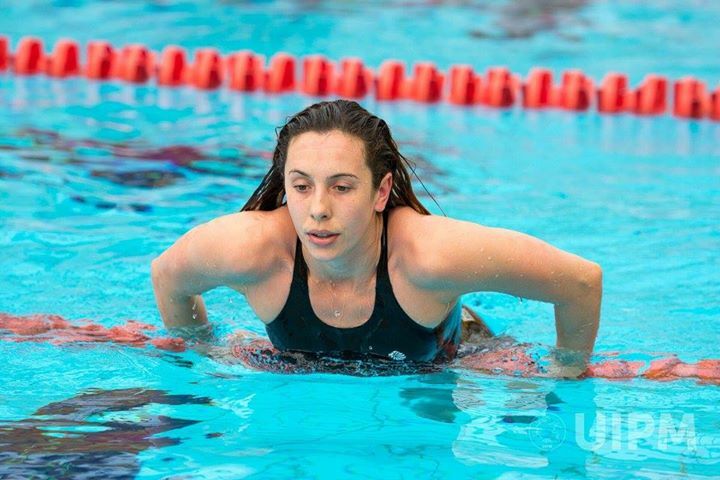 Sam had a great swim, the fifth fastest of the day with a time of 2.12.04 and was in 5th place going in to the final event of the two day Final. 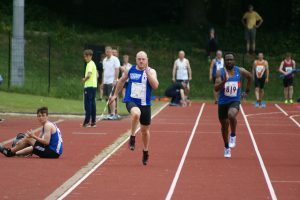 Sam spoke to the Club after the World Cup Final and commented that there were “Some promising signs during the competition which saw me enter the final event in 5th place. 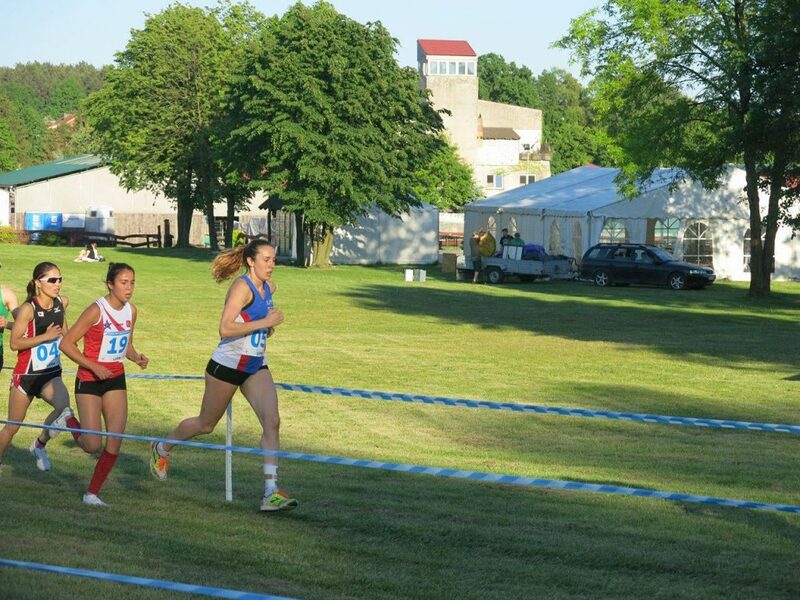 However, I have so much work to do for my overall fitness as I felt totally empty of energy before the run. 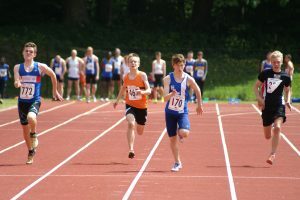 The competition format I found exhausting with 3 consecutive days of competition. 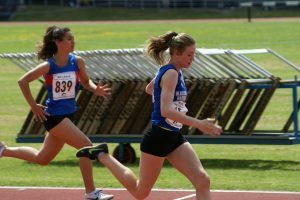 I really struggled to recover after each day. 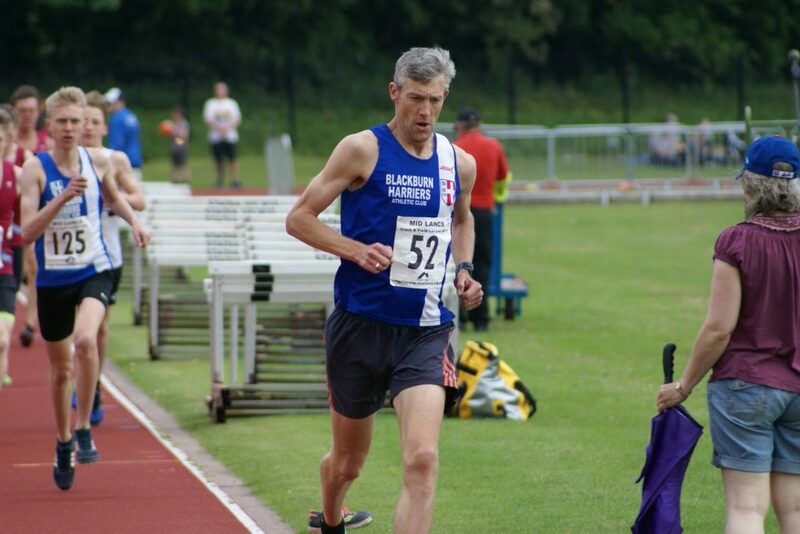 I think I need to invest in some recovery aid to help me for my next event in July. 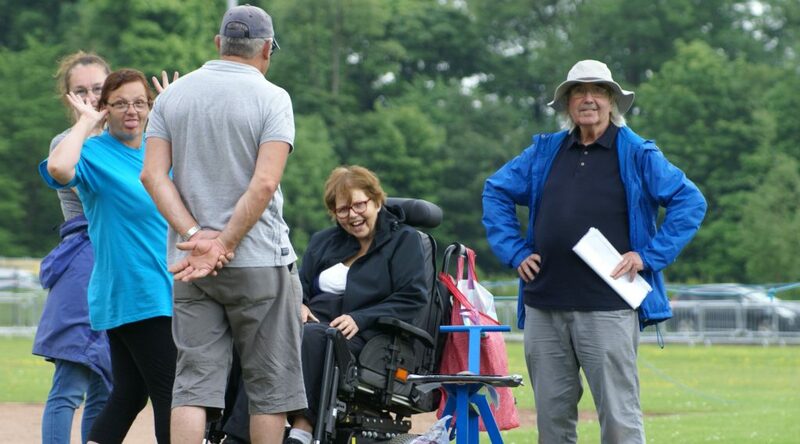 Currently looking at the normatec recovery machine. 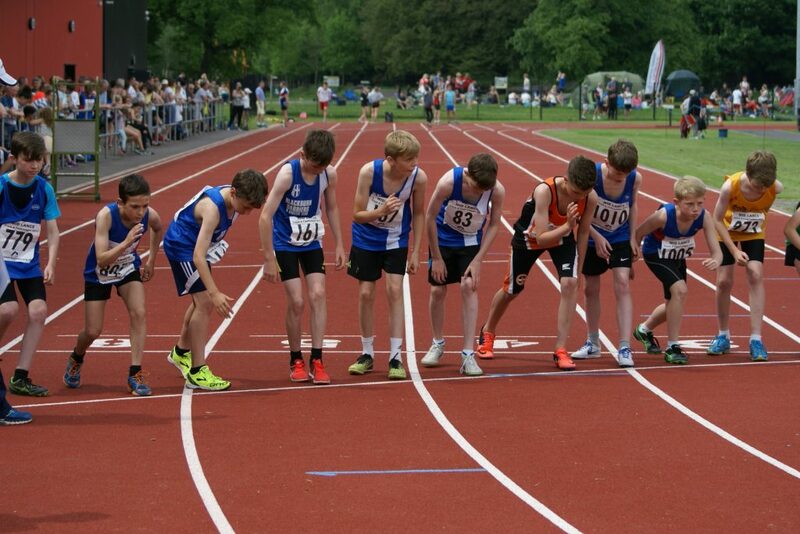 So if anyone has any advice or experience with this please get in touch”.